What is Homesteading? Ways to go green and live gently. Going Green in the Backyard. What is Homesteading? Any home can be a homestead by practicing green techniques and backyard farming in an urban space or roomy acreage. A greener way to live. Homesteading is a collection of sustainable habits that can form a healthy eco system in your yard or acreage. It includes all areas of going green at home and self sufficiency. Starting with using less... of everything. Toothpaste, laundry detergent, paper towels, garbage bags, energy use, cleaning solutions... you name it and there's a way to cut down on it's use. Recycling, repurposing and re-using the items that come into your circle (and bringing fewer things into that circle) reduce the waste coming from your home. Growing food, composting, collecting rainwater, raising hens for eggs, canning and preserving... homesteaders have adopted a whole group of sustainable practices that are a lot like.. well, a lot like what our parents and granparents did. Turns out progress might not have been that progressive after all and there's a tide of people going back to simpler lifestyles like backyard farming and all manner of responsibly managing their piece of paradise. It has come to our attention that the consumerist attitude that big business fosters, isn't good for the planet, and it hasn't made life easier or anyone happier. Families that are homesteading today, benefit from the organically home grown food while providing kids with real food, a safe place to grow and a real connection to the planet. Homesteading your home is a way of communing with nature and inviting the eco system back, encouraging good bugs and flora to make a home in your yard. A burgeoning give and take environment can exist for those who want to re-connect with family and bring Mother Nature back into the fold. "I may not be able to change the whole world today, but I can change my little corner of it." is the homesteaders mantra. With even a few square feet you can make a difference in your life that overflows onto the planet. 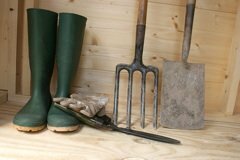 Homesteading includes all areas of going green at home and simple habits you can start today. A seamless cycle exists between lush life and decomposition. Although the answer to the question is as elusive as the chicken and egg answer, it matters little which came first. What does matter is the fact that they depend on one another. What is homesteading? It's a way for individuals to reconnect with the real world. Visitors to our What is Homesteading page may also be interested in the following pages.